The Palestinian Ministry of Detainees in Ramallah issued a statement marking the twelfth anniversary of the kidnapping and imprisonment of Palestinian leader, legislator Marwan Barghouthi, who was sentenced by an Israeli military court to five life-terms and an additional 40 years imprisonment.The Israeli army kidnapped Barghouthi on April 15, 2002, after having listed him as one of the “most wanted” Palestinians. The statement also said that the Palestinian people and their leaders will not abandon the detainees who are facing ongoing abuse and atrocities, that they will not abandon Marwan Barghouthi, nor the secretary-general of the Popular Front for the Liberation of Palestine, Ahmad Saadat, nor any detained Palestinian. The ministry further stated that the Palestinian leadership intends to start its upcoming legal battle focused on the release of all Palestinian political prisoners, and the liberation of Jerusalem. It also said that the case of Barghouthi, the secretary-general of the Fateh movement, an elected legislator, has placed Israel in an international legal dilemma, since his abduction and imprisonment is illegitimate, and part of Israel’s war on late President, Yasser Arafat. Israel accuses Barghouthi of being the key factor which led to the Al-Aqsa Intifada in late September 2000, and described him as the “engineer of the Intifada “, especially since he believes in ongoing resistance, even during negotiations, saying that as long as there is an occupation and oppression, there will always be resistance. Following 15 years of direct talks with Israel, Barghouthi reached the conclusion that Israel turned the Oslo peace agreements into a trap that led to massive construction and expansion of settlements in the occupied territories, especially in and around occupied Jerusalem. Israel voided its own commitments long ago, as peace talks should have led to a transitional Palestinian state in 1999. Instead, Israel escalated its settlement activities and its theft of Palestinian lands, making the two-state solution unrealistic. The ministry said that Barghouthi was subject to an extended and extreme interrogation for more than a hundred days, but “the only thing the Israeli interrogators found through the interrogation was this strong man, this strong leader”. Barghouthi was then placed in solitary confinement for two consecutive years, but remained a leader and a symbol of steadfastness and courage. His case garnered massive attention from the international community, and he refused to recognize any legitimacy of Israeli occupation courts, an issue that also pushed various international lawyers to adopt his case. 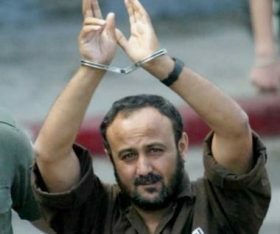 Many Israeli political leaders realized that the imprisonment of Barghouthi harmed Israel’s image around the world, largely impacted public opinion, and some even admitted that when Israel put Barghouthi on trial, it effectively put every Palestinian on trial, and every person who struggles for liberty, independence and human rights. Dozens of city councils around the world placed Barghouthi’s picture on their doors and walls, some even granted Barghouthi residency and even honorary passports, while activists printed thousands of posters and shirts carrying his pictures and his words. It is worth mentioning that Barghouthi obtained his PhD while in prison, and was frequently placed in solitary confinement, as Israel fears his statements and actions, due to the massive popularity and support he enjoys among the Palestinians, and his supporters around the world. Barghouthi has also called for a unified Palestinian and international strategy based on strengthening popular, nonviolent, resistance against the occupation, also based on boycott, divestment and sanctions against Israel for its ongoing violations of international law, including its ongoing aggression, and its illegitimate settlement construction and expansion activities. He believes that the key to ending this conflict is ending the Israeli occupation of the occupied territories, the establishment of an independent, viable and continuous Palestinian state, with Jerusalem as its capital, the release of all Arab and Palestinian detainees, and the implementation of the internationally guaranteed Right of Return of all refugees. His legitimate demands, the demands of the Palestinian people, their yearning for liberty and independence, are guaranteed by the Fourth Geneva Convention, International Law and all related conventions and agreements, while Israel continues to violate these agreements and continues its illegitimate occupation of Palestine.